Ali Smith’s first collection of stories won the Saltire First Book Award and a Scottish Arts Council Award. She lives in Cambridge, England. ". . . in Smith's hands, this slender plot serves as an excuse for a delightfully inventive, exuberant, fierce novel of which the real star is not the dead Sara, or any of the living characters, but the author's vivid, fluent, highly readable prose. HOTEL WORLD was a well-deserved finalist last year for two prestigious British prizes: the Orange Prize and the Booker Prize. . . . I can't begin to paraphrase all that this dazzling book conveys about humanity and mortality . . ."
"Ali who? Hotel what? Even for people who follow contemporary British literature, neither the name nor the title meant a lot. They do now. HOTEL WORLD makes a striking impression. It's a challenging, often bleak but affecting journey through the lives of four young women united by the death of another . . . What an introduction to Ali Smith. "HOTEL WORLD is that rare experiment, a novel with style to spare . 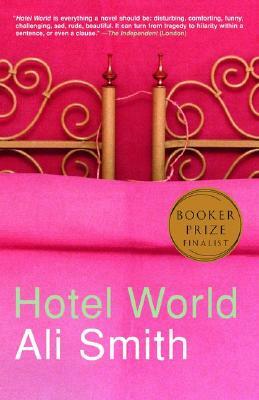 . . despite all the tricks, all the tweaks of language and literature, what you remember about HOTEL WORLD is Smith's evocation of the anguish that results when a life ends, her rendering of the sadness at separating from the living world and the loneliness of staying behind. What a death. What a life. What a book."